Many clients will possess postural distortions or imbalances which greatly impede their ability to safely and effectively engage in a comprehensive exercise program. Postural imbalances can impair joint function and stability, compromise coordination between bodily segments, increase energy demands during completion of any given task, reduce force transfer through the kinetic chain, and increase the overall risk for injury (among other negative effects). In some cases the distortions impede neural signaling which impacts proper activation causing movement compensations which lead to injuries. These postural issues may arise from a number of factors associated with activities of daily living (ADLs) as well as recreational endeavors or sport participation. ADLs that promote postural inefficiencies are often related to repeated occupational or social habits, such as slouching in front of a computer while at work leading to pelvic instability. Among more athletically-inclined clients, common causes of postural distortion may include performing repetitive actions that lead to overdevelopment or overuse issues, previously engaging in poorly-devised weight training programs, being improperly instructed on proper exercise technique, and movement compensations with or without the presence of an injury. In any case, distortions create localized dysfunction which may extend across the kinetic chains. They often present with pain as well as reduced skeletal function and performance. Forward shoulders will likely cause impingement syndrome, an example of localized dysfunction. 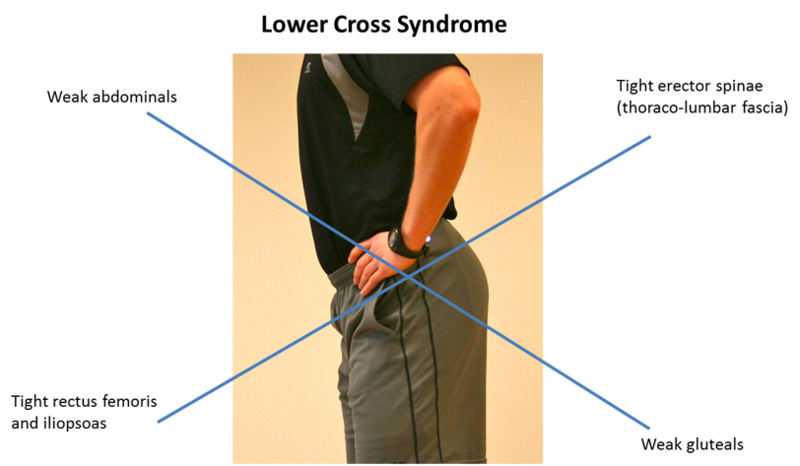 Whereas, IT band syndrome developed from gait changes associated with a lateral pelvic tilt would be an example of an interactive disturbance. Assessment of posture can be easily accomplished by using a plumb line to observe variations in anatomical positions. A plumb line aligned to the side of a client should run vertically through the hole of the ear, acromioclavicular joint of the shoulder, central vertebral bodies, the greater trochanter of the hips, slightly anterior to the midline of the knee, and end at the heel through the lateral malleolus of the ankle. 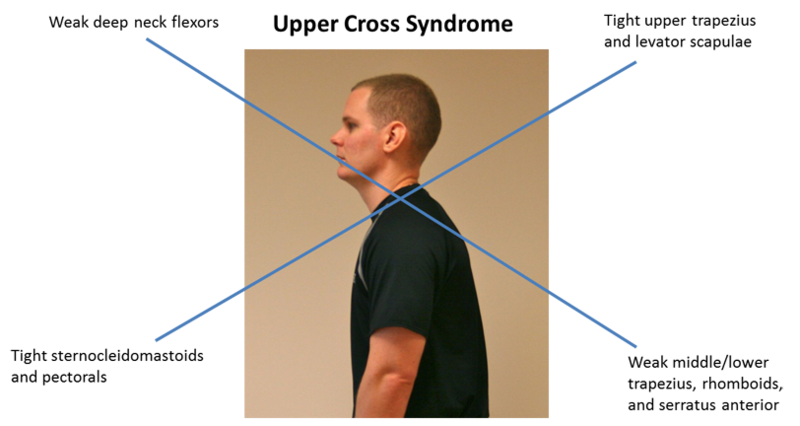 Variations to this posture suggest a possible consequence in static posture and movement. If a plumb line is not available or a trainer is not proficient in identifying the anatomical locations, other observational assessments can be employed to discern postural issues as will be detailed later. Certainly genetic predisposition may increase one’s propensity toward postural deviations, but in general, afflictions are usually developed over time. And while acute responses may trigger problems; in most cases they are brought on by chronic behaviors. When one joint becomes misaligned, the resultant asymmetries can lead to several additional problems down the kinetic chain. For instance, recruitment of agonist muscles can become inhibited by overactive antagonists. This is commonly seen when the hip flexors take on a greater role in pelvic stability, resulting in inhibition of the abdominals and hip extensors. These inefficiencies play a part in what is referred to as the lower-cross syndrome. When any of these interactive types of postural issues occur, the body experiences a greater resistance to movement as well as a reduction in stability and energy transfer during exercise. Each client can be evaluated for musculoskeletal efficiency to detect any flaws in their static and dynamic postures. In doing so, the trainer ensures that the program incorporates activities to correct potentially-damaging postural distortions. The first step in this process involves an understanding of the underlying characteristics that perpetuate postural limitations. Commonly, postural and phasic muscles (those that allow for the transfer of force between joints) become either too tight/overactive or lax/underactive, depending on the chronic conditions applied. Interestingly, postural muscles tend to exhibit tightness and increased strength from over-activity whereas phasic muscles tend to progressively weaken. Without efficiency in joint function, postural muscles will incur increasing demands. In response, phasic muscles experience reduced stress and become weakened over time, inhibited by compensatory actions. In order to influence phasic muscle activity while inhibiting postural muscle activation, traditional programs must be redesigned to emphasize specific activation patterns. For example, a client presenting with the upper-cross syndrome should be instructed by a knowledgeable trainer to increase the quantity of upper body pulls while reducing loaded presses in exchange for ROM activities to help balance out issues within the shoulder complex. 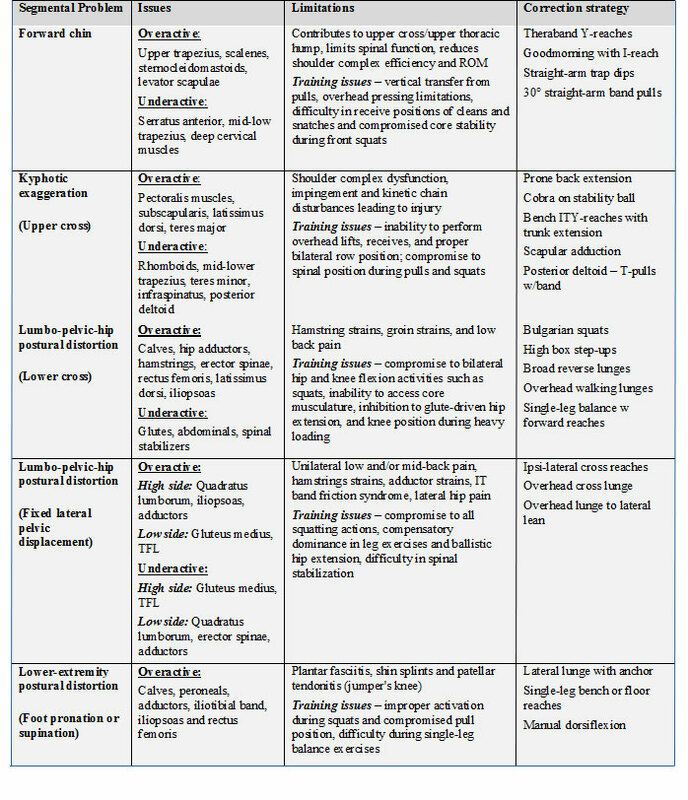 The following table provides a segmental overview of common postural distortions. The muscles involved in each distortion as well as training limitations/issues are addressed. Consider the correction strategies as part of a dynamic warm-up or as exercise modifications in your program. See the NCSF YouTube Channel for more examples.